Australia Post celebrates the birth of the future King of Australia with a stamp. Australia Post is celebrating the birth of Prince George to the Duke and Duchess of Cambridge with the release of an instant stamp sheetlet. 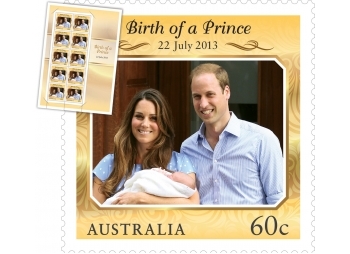 The stamp features an image of the Royal couple leaving St Mary’s Hospital Paddington with their newly-born son and will be available in a sheetlet of 10 x 60c stamps from participating Australia Post retail outlets from Monday, 29th July 2013. The Prince was born on 22nd July at 4.24pm BST. The newest member of the Royal Family was introduced to the world the following day on the steps of the hospital, in the arms of his proud parents. The Duke and Duchess of Cambridge have since named their son George Alexander Louis. “Australia Post is delighted to celebrate the birth of a baby boy to the Duke and Duchess of Cambridge, with a sheetlet of stamps that captures the first public appearance of the happy family,” said Australia Post Managing Director and CEO, Ahmed Fahour. The birth of a future monarch is always a highly anticipated event and the child of the Duke and Duchess of Cambridge, who will be third in line to the throne after Prince Charles and Prince William, was no exception. The sons of Her Majesty Queen Elizabeth II – Charles, Andrew and Edward – were born at Buckingham Palace, while Princess Anne was born at Clarence House. Today the preferred birthing facility used by the Royal Family is the Lindo Wing at St Mary’s Hospital in Paddington. The baby’s father Prince William was born there, as was his uncle Prince Harry. A notice of the birth was attached to an ornate easel in the forecourt of Buckingham Palace, with the media officially informed. There were royal gun salutes across London heralding the new arrival. The designer of the stamp is Sonia Young of the Australia Post Design Studio. The associated products available are a commemorative cover, stamp pack, maxicard and a booklet of 10 x 60c self-adhesive stamps. The Royal Baby stamp issue is available from 29th July 2013 at participating Australia Post retail outlets, via mail order on 1800 331 794 and online at www.auspost.com.au/stamps while stocks last.